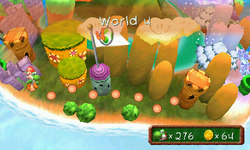 World 4 is the fourth set of stages in Yoshi's New Island, and is located in a savanna. Kamek and Furious Fred de Fillet are the bosses of this world. Hop 'n' Pop Till You Drop: This level features balloons. Underground Pokey Patrol: This level features Pokeys. Spin-Lift Drift: This level features the only Goombas in the game. Fort Key Calamity: The seventh castle of the game. Metal Eggdozers on a Roll: This level features Metal Eggdozers. Chomp Shark Chase: This level features Chomp Sharks. Flatbed Ferry Freefall: This level features Flatbed Ferries. Furious Fred de Fillet's Castle: The eighth castle of the game. See Poochy Run! : This level is centered around Poochy. This page was last edited on March 27, 2019, at 15:39.